Ambassador Hardt and Goldie Scott. [www.inewsguyana.com] – United States Ambassador to Guyana, Brent Hardt recently met with Goldie Scott upon her return from the United States after participating in the prestigious Embassy-sponsored International Visitor Leadership Program (IVLP) exchange. Scott, who is Chief Executive Officer of the Volunteer Youth Corps Inc., shared her IVLP experience with the Ambassador and discussed how she intends to apply the insights gained from her experience to the benefit of her organization and to Guyana. 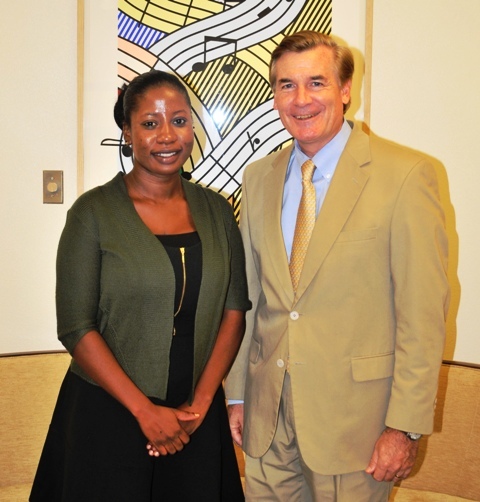 Ms. Scott participated in an IVLP exchange on the “Caribbean Basin Security Initiative – Engaging Underserved and At-Risk Youth,” from September 7 to September 28, 2013. Under the Caribbean Basin Security Initiative (CBSI), the United States, CARICOM member nations, and the Dominican Republic are working together to help reduce the number of young people imprisoned in the juvenile justice system. CBSI is also working with youth already being held in juvenile facilities by supporting their transition back into communities and toward the establishment of a productive life. In his meeting with Ms. Scott, Ambassador Hardt encouraged her to build on the many professional linkages she established with U.S. institutions and other IVLP participants from countries within the Caribbean to strengthen the work of her organization in communities throughout Guyana. Ambassador Hardt noted that the IVLP offers one of the best means to build capacity and strengthen institutions, as it fosters an exchange of new ideas with leading U.S. experts and organizations, while establishing lasting professional connections among IVLP participants. He commended Ms. Scott for the work her organization has done in developing and strengthening the capacity of Guyanese youth to help them make positive choices and lead productive lives. The IVLP, which also included participants from the Bahamas, Suriname, and Trinidad and Tobago, examined primary prevention programs for at-risk youth, including programs for family support, after school activities, truancy and drop-out prevention, and job training. Participants were given a firsthand look at support services for gang-involved youth and their families aimed at helping vulnerable youth make positive choices. As the Chief Executive Officer of a local non-governmental organization, which addresses the social and economic needs of children and youth, Ms. Scott was able gain perspectives on methodologies used by community-based organizations and faith-based groups to intervene early before problem behaviors turn into delinquency and gang involvement. Ms. Scott is presently coordinating a sub-agreement between the Volunteer Youth Corps Inc. and Education Development Centre under the USAID/Skills and Knowledge for Youth Employment (SKYE) project to deliver ‘Work Ready Now’ training to at-risk youth in Region 4. The International Visitor Leadership Program is the flagship professional exchange program of the Department of State, which annually brings to the United States approximately 5,000 foreign nationals from all over the world to meet and confer with their professional counterparts and to experience the United States firsthand. The visitors are current or potential leaders in government, politics, the media, education, the arts, business and other fields. Among the thousands of distinguished individuals who have participated in the IVLP since its inception almost seven decades ago, are more than 290 current and former Chiefs of State and Heads of Government, 2,000 cabinet-level ministers, and many, many other distinguished leaders from the public and private sectors.